Morton Feldman's music demands deep listening; the four hours on the edge of silence of his For Philip Guston do not reveal their secrets the first time around. His series of four pieces collectively titled The Viola in My Life provides a more accessible entrée; I would call the last of these - at hand on a new disc on the EMF (Electronic Music Foundation) label - truly beautiful. The solo viola spins its web: short melodic curves swooping down and up, against bursts of orchestral commentary. I don't want to belabor the spider analogy, but the sense of dimension in this work, of forces in motion in the near and far distance, and - as in all of Feldman's work - of the shards of silence alternating with soft, mysterious sounds can hold you spellbound over a 20-minute span (as in this work) or over the four hours of Guston. Feldman's Instruments II, also on the disc, similarly seeks to weld sounds and silences into a consistent linear experience but does so, to these ears, less successfully. It's the viola that connects the dots and provides the exhilaration in the first work - in Feldman's life and, through him, in ours. 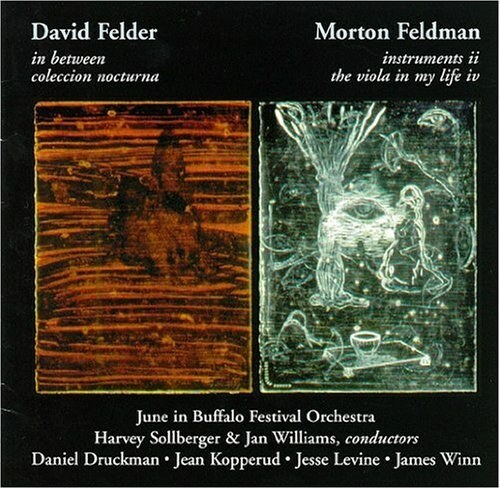 The performances are from David Felder's excellent June in Buffalo Festival, with Jesse Levine the solo violist and an orchestra assembled from the new-music performing nobility worldwide. Felder, formerly of UC-San Diego, has two works on this disc as well - aggressive, intense works that form glistening, rounded surfaces where Feldman aims toward flat planes. Heard together, these four works - the two by Felder interspersed with the two by Feldman - form an absorbing, often exhilarating display of great contemporary spirits at work.